Marine apprenticeships have historically played a major role in developing the skills and expertise of the marine workforce. According to British Marine’s Labour Market Survey (September 2016), the UK marine industry employs 470 apprentices across 100 businesses. Almost three quarters of these apprenticeships are in manufacturing and engineering (43% boat manufacturing, 21% repairs and servicing, 8% equipment manufacturing). To ensure that marine apprenticeships continue to support and develop the skills required by the industry, marine employers have embraced the government’s ongoing apprenticeship reforms. A key element of the reforms is the development of new apprenticeship standards, Trailblazers, which are approved for delivery via the Institute for Apprenticeship’s stringent approval process. 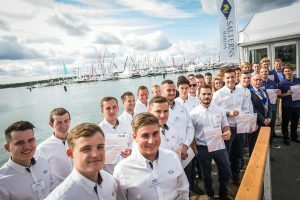 British Marine, the membership organization leading the UK leisure, superyacht and small commercial marine industry is supporting its members to form employer groups to develop the apprenticeship standards that will ensure the industry maintains and grows its skills levels now and in the future. British Marine has over 1,550 members drawn from both seagoing and inland sectors and represents an industry employing more than 33,000 people in the UK. British Marine’s Training Manager, Blue Davies commented: “Apprenticeships are growing across the marine industry and more and more of our member companies are benefitting from taking on apprentices.” The apprenticeship standards developed by the employer groups supported by British Marine include Boatbuilder, Marine Engineer, and Marina and Boatyard Operative. Further standards are planned or are currently in development, these include the Marine Electrician, Yacht Painter and Sprayer. Others will be developed, as demand for apprenticeships in marine occupations is identified. The industry is also engaging more and more with non-marine specific apprenticeships, in areas like IT, business administration and marketing. Keith Longman, Yard Manager at British Marine member company Berthon Boat Company Ltd, and a Trailblazer group employer chair had this to say about the role of British Marine on apprenticeships: “British Marine are at the forefront of ensuring that new apprenticeship standards are being built to ensure we have training that meets the needs of employers.” Employers have a clear understanding of what training they require for their apprentices, and having the opportunity to engage in driving change as well as determining depth and breadth of delivery has been a hugely positive step in creating qualifications and apprenticeships that are up to date and fit for purpose for the marine industry.” Supporting the formation of employer groups to develop the new and more robust marine related apprenticeship standards is just one way that British Marine helps ensure growth and quality of apprenticeships in the industry. British Marine also provides advice and guidance to member companies about the wider apprenticeship reforms and advice available to member companies wanting to employ apprentices. British Marine, working in partnership with Apprenticemakers also offer Apprenticeship Mentoring workshops. These are highly interactive and provide a thorough understanding of the vital mentoring role, covering the skills and tools required for effective mentoring. The workshops enable delegates to practice relevant communications skills and help delegates consider how mentoring can help with the challenges facing apprentices in the workplace. The work shops help mentors understand how they can empower apprentices so that they take ownership of their work and study goals. A delegate on a recent workshop commented: “various businesses shared their experiences and having that line of communication opened up was really interesting. We heard from other British Marine member companies who were responsible for training apprentices, and it was great to get their ideas and insight. “We also took part in roleplay exercises where we acted out various scenarios and looked at the different outcomes – really hands on stuff that made the workshops relaxed and fun and took us away from traditional sitting in a classroom learning. Our perception of mentoring and how it can impact our young staff has changed dramatically as a result.” British Marine is also taking an active role in promoting apprenticeships, not just in the marine industry, but across all industries. British Marine provides a wide range of activity and support to help develop and deliver training skills development and career promotion for the benefit of its member companies in the UK marine industry. For more information on the work and role of British Marine in this area, visit: www.britishmarine.co.uk/careers.